Why is Nobel economist Paul Krugman continually ignored? So, I’ve had a mild-mannered dispute with the economist Joe Stiglitz over whether individual income inequality is retarding recovery right now; let me say, however, that I think there’s a very good case that the redistribution of income away from labor to corporate profits is very likely a big factor. 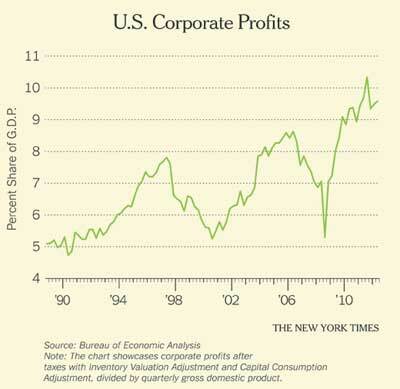 Take a look at the chart on corporate profits as a share of gross domestic product. Corporations are taking a much bigger slice of total income — and are showing little inclination either to redistribute that slice back to investors or to invest it in new equipment, software, etc. Instead, they’re accumulating piles of cash. If you put money in a bank, the bank might just accumulate excess reserves. If you buy securities from someone else, the seller might put the cash under his mattress, or put it in a bank that just adds it to its reserves, etc. The point is that buying goods and services is one thing, adding directly to aggregate demand; buying assets isn’t at all the same thing, especially when we’re at the zero lower bound. And now we’re looking at the impending sequestration which in all likelihood will further stall economic recovery. Do politicians just not care about citizens or are they intentionally trying to keep us down? What do they gain by keeping us afraid of impending poverty? Just as they frightened us with the dangers of Obamacare which will actually benefit most they now say spending to stimulate the economy will destroy us with debt. Do out of work people really believe that the national debt is more harmful to them than not having a job and losing unemployment benefits? THIS IS OUR OPEN THREAD. SAY ANYTHING. Stéphane Hessel has passed away during the night. The Holocaust survivor, member of the French Résistance, diplomat and author inspired the “Occupy” movement with his pamphlet “Time for Outrage” in his later years. I saw numerous interviews with him and greatly admired his intelligence, sense of humor and humanity. May he rest in peace. Or Why Section 1, Article 2 is suddenly in the forefront. The Republican Party, having been stung in the past two Presidential elections have taken it upon themselves to change the rules. Red states will continue to award electoral college votes on a winner take all basis. But in Blue state after Blue state, Republicans are introducing measures to apportion electoral college votes based on the percentage of the popular vote each party receives. The net result should guarantee that Republicans would regain the White House in 2016, even if they lost the popular vote by a landslide. In fact, the various States could decide to appoint Electors without regard to the popular vote. That’s how broad the power granted to the State’s Legislatures is. As of this writing, the move to rig elections hasn’t gotten much traction. But in the article linked above, it looks like the Pennslvania State Legislature could ram this through and get it to a willing Republican Governor’s desk for his signature. In these days of very few swing states, even one of them adopting such a rigging scheme could make a difference in the next Presidential election. The Michigan GOP is eager to do the same thing. Republicans have finally figured out that the people aren’t buying what they have to sell. If our democracy applied the same market rules as Capitalism, they would be out of business. But instead of changing their product line, they want to change the rules of the game; they want a monopoly over the election process. This, then, is the argument for amending the Constitution to call for electing the President and Vice-President based on the nation-wide popular vote. To be sure, the Ruling Class will spend hundreds of millions to defeat such an amendment. Already too much power has been consolidated into a hand-full of elected representative who are beholden only to the very, very wealthy. They have gerry-rigged districts, safe seats, and access to virtually unlimited war chests and attack ads to defeat any challenger. We, the people, must choose: either we change the current system through peaceful means, or it will get to a point where change will come through violence. Just know this; even in peaceful protests, people die. Those in power will, far too often stop at nothing to maintain that power. The uprisings in the Middle East foreshadow the United States’ future unless something changes.